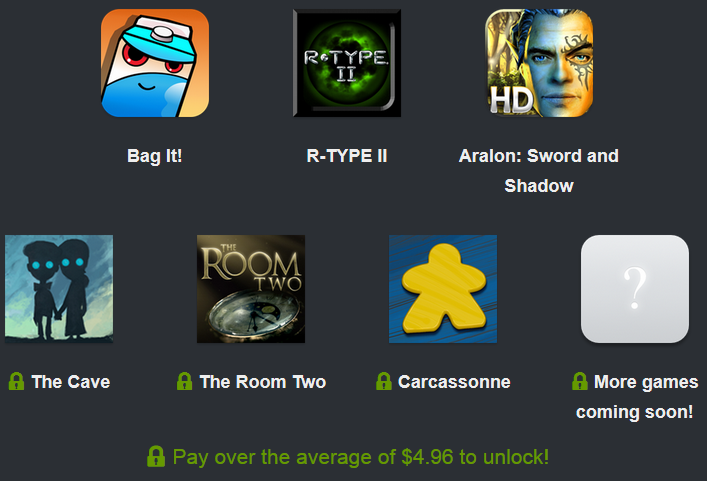 The latest mobile Android Humble Bundle has gone live with some sweet titles to enjoy on your Android device. Bag It! is a Tetris-esque grocery-themed puzzle game, R-Type II is classic space shooting action, and Aralon: Sword and Shadow looks like a wholesome RPG experience. As it goes, those three can be had for any price, but beating the average will also get you The Cave, The Room Two, Carcassonne and additional yet-to-be-revealed mystery games. As always, a customizable amount of your purchase goes toward the Electronic Frontier Foundation and Child's Play charities. UPDATE 4/22: R-Type, Enviro-Bear 2010, and Paper Monster have all been added for those who beat the average.